A good children's martial arts program develops self-confident, assertive leaders. Kids are encouraged to put their hands up. Every child has the potential to become a leader. I have seen many children in my organisation over the years become excellent leaders—many were shy and withdrawn when they started the martial arts. Their leadership qualities were built slowly over time. Here are the most important qualities of great leaders and how the martial arts can develop each one. They are self confident and assertive. Great leaders believe in themselves and resist peer pressure. They are not afraid to ask for what they want. The praise and recognition children receive in a good martial arts program will help build this self-confidence. The small steps children take in their progression mean a lot to them—they are celebrated. Children learn to ask the sensei when they need help–this builds their assertiveness skills. Nobody follows a leader with a negative attitude. We all gravitate toward positive thinkers. The martial arts develop a can-do attitude among its students. Negative thinking has no place in the training hall, and this rubs off on the kids. 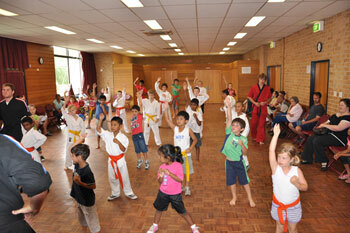 In a good martial arts program, children learn to put their hands up to explain something to a large group. Sometimes they get flustered—that’s ok, because each time they put their hand up it gets a little easier. Shy, withdrawn students come out of their shells and get comfortable explaining things in front of the class. They also learn how to take their turn and listen while the other children are speaking. Listening well is another mark of a great leader, as this exhibits tolerance toward others’ opinions and an open mind. A great leader might have to make decisions that are unpopular, but are for the good of the organisation. A child can learn to handle the pressure of a martial arts grading, where 100 people might be present. This will carry over into other areas of their lives, like resisting peer pressure and worrying about how others view them. Going along with this quality is persistence, which all great leaders possess in abundance. They simply do not give up. They have good organizational skills. All great leaders need organizational skills. By creating checklists, or working their way through lists of techniques needed for their next grading, children learn to manage their limited time. They learn to prioritise by spending more time on their weaknesses, while balancing this with school or family responsibilities, building their organizational skills. A great leader takes the ownership view and is always thinking about how they can benefit the organization. During or after class some of my students will come up and ask if I need help putting away kick bags or cones. That is the first step toward becoming a leader. They are able to focus. Getting past all the clutter and seeing the big picture is an important quality of great leaders. The martial arts are legendary for their ability to develop concentration and laser-like focus on the task at hand. Being able to motivate yourself and work on your own is something martial artists excel at. It is not a team sport, and in most cases there is not a coach to constantly be after you to practice. You learn to work outside of class on your own to achieve your goals. The student also learns to sacrifice their time while friends are doing other fun activities. This builds self-discipline. They have a sense of justice and fair play. A great leader must do what is right. Children learn the value of taking turns and playing by the rules in martial arts activities. They learn that if everyone feels like they are treated fairly, the entire class is happy. They have their own good role models. Every great leader had someone to follow at one time or another. In a martial arts school, the sensei is a great role model to follow as he or she is likely to be a superb leader. Building leadership skills in our children is one of the best things we can do to ensure they have a bright future. Why not give them a head start by enrolling them in a good martial arts program? this is ABSOLUTELY correct, i think for sports in general, but especially MA. Children learn that they can win, that in itself is priceless. Its really cool to watch kids learning martial arts..
Great post Matt. Since I’ve been working with the children in our junior class (which is well over a year now) I’ve begun to see some of the traits you talk about becoming evident in some of our children – it’s great to be a part of helping them in this way. Yes Anthony, every child is a winner in the martial arts. Belief in yourself is the key. Thanks for commenting. I agree modge, it is one of the coolest and most inspirational things in the world. Thanks for your visit. You make some great points here Matt about martial arts building leadership skills in children. I particularly like your point about being a good listener – an area that is often over-looked. Great looking website – keep up the good work. Thanks Jan, a great leader needs to know every side to the story. It helps to listen. Appreciate the complements. I agree with all of the above and would like to include problem solving ability. You see to overcome adversity and learn fighting strategy – one has to adjust his/her game plan on the fly. Hi John, I did not think of that one, but yeah, the best leaders are problem solvers. Thank you!